I have a small haul for you today. Sinful Colors has been releasing several new new collections in the last couple months. This last weekend I went on the “hunt” looking for one of the most resent collections. 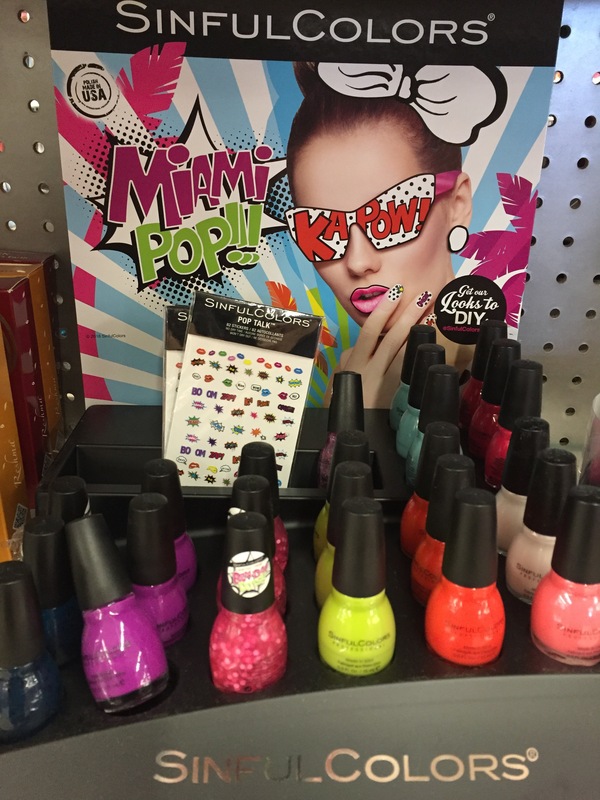 Miami Pop has an eight color display that has four new colors. Two of the new colors are creams and two are thin jelly polishes with round matte glitter. Kmart is not the first place I think of when it comes to Sinful Colors displays. It wasn’t until I was told by a friend that she could not locate any of the new colors in the Walgreen’s data base that Kmart even popped into my mind. No signs of the display were found at the first Kmart location so I was very surprised to find an almost full display at the second store. I quickly took a picture of the display, posted it to my Sinfully Polished FB group and grabbed the four new polishes. Factory Fad is thin for a jelly polish and some fishing will need to be done to get any glitters. I used two coats and was no where close to achieving opacity.The round glitters tend to sink to the bottom so you will want to leave it upside down if you want any of the glitters. This polish would look great as a pond mani and will probably be how I use it. Some may want to use it as a topper for Lapis It Up to change the look some of a one polish mani. Graphic Girl is a thin pink-red jelly with white round glitter. Either the base is thicker than Factory Fad, which it didn’t seem that way, or the glitter is lighter so I doesn’t sink to the bottom. You will still need to fish for glitters but they are suspended a lot more than Factory Fad is. This polish will also look great as a pond mani but not a polish to reach for if you want an opaque look. Again with this polish it may be used as a topper to Mod Muse. Third in the line up we have Mod Muse. This is one of two creams offered in this collection and is a orange-red color. Like with most of the Sinful Colors creams this has a nice formula and is opaque in two coats. I’m curious to see if I have any polishes similar in color. Lastly we have Lapis It Up. Light blue-green cream that is opaque in two coats. My most similar in color polish is Summer S-cool. You can see from the picture below that Summer S-cool is lighter in color. So which is your favorite? Do you see yourself picking these up?